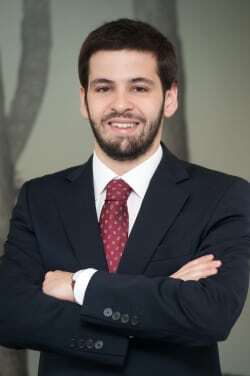 Pedro Saraiva has a Law degree from the Catholic University of Portugal and was an exchange student at Fundação Getulio Vargas Law School in Rio de Janeiro, Brazil. He further holds a post-graduation in European Union Law from the Faculty of Law of the University of Lisbon and an LL.M in European Law from the College of Europe, Bruges, Belgium. He joined VdA in 2015 and is currently a junior associate in the competition and EU area of practice where he has been actively involved in several transactions in a wide range of sectors, notably telecommunications & digital services, postal services, ports, transports, banking and insurance. He regularly advises clients in a broad range of antitrust subjects before both the PCA and the European Commission. Before joining the firm he was a blue-book trainee at the Online & Postal Services Unit at the European Commission's Directorate-General for the Internal Market and Services and a trainee legal adviser at the European Sanctions Unit of the Ministry of Foreign Affairs of Portugal.